Park near the junction of two minor roads (Aikengill Road and Whitepits Lane), 400 yards west of a junction with the Slaidburn-Bentham road. The name is pronounced “Crows-dale”, but map-makers spell it “Crossdale”. Local signage sensibly uses “Croasdale”, which is the spelling used on this website. From the road junction, start with your back to the nearby cattle grid, and fork right off the eastbound road, across an area of close-cropped grass, beyond which you will come onto a well-used path which converges with a small valley on your right and then goes through a shallow saddle before ending at the junction of two surfaced roads. Go straight across the first road (Ringstones Lane) then turn right along the second, so that you are heading towards Slaidburn. Follow the road for over ½ mile, until you reach a cattle grid. 60 yards after the cattle grid, turn left by a footpath sign, through a gate, the follow the wall on your left to a field corner. Cross the stone stile into the next field, then turn half-left to cut across the field corner. Follow the path down the side of a small valley, then roughly follow the wall/fence on your left to a ruined barn with a tall tree. Bear slightly left after the ruin, towards the houses at Higher Croasdale Grains, following the fence/wall on your left to a gate, and then beside a fence to a stile. After this, turn left and follow the fence on your left up towards the green house, until you are 20 yards from its fence, then turn right and head towards an electricity pole with transformer. Bear right when you reach it, and follow the fence on your left to a gate in a wall. Continue with the fence on your left to a gate, then keep ahead past a barn on your left, towards Lower Croasdale Grains cottage. Turn right before the wooden cottage fence, then walk beside a barn on your right to its corner, then right so that you keep beside the barn and reach a gate leading into a field. 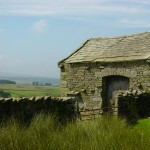 Turn half-left and head down the field to a tall ladder-stile over a wall. 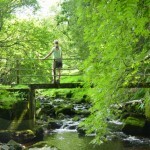 Cross this, then Croasdale Beck, than follow a track up to another ladder-stile. Cross the stile, then keep ahead through the rushes, and nearly level, to the next ladder-stile. After this, skirt the top of a steep slope, then keep in the same direction as before, roughly parallel with the beck down on your right. When you are about 100 yards from the Slaidburn road, you should pass just to the right of the junction of two ruined walls, then bear left to follow one of the walls at first, and then a line of rushy ground, to a gate leading onto the road. Turn left along the road, and after 50 yards, turn right by a footpath sign, through a gate. Follow a grassy track, and then the fence on your right, to a gate. After this, diverge from the fence on your left up a a gateway in a fence, then keep in the same direction to a gate and stone stile in a wall. Now aim for the barn (Higher Craggs) ahead, to a stone stile by the right-hand gate, and continue to the next stone stile, which is 20 yards left of a gate, just before the barn. 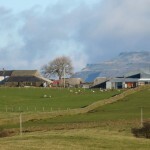 Pass the barn on your left, then turn right by its big front door, to a gate, then left to follow the wall and fence on your left, passing through a gate and then approaching Craggs farm. Bear right before reaching the field corner, to a stile which is just left of a green shed. Go past the shed to a small gate, keep ahead past a house on the left, then turn left between the house and another house, through a gate, and then down the farm drive to a road. Go straight across, across a cattle grid, and down a drive to Brackenbottom. Go through the gate before the houses, then turn right through the next gate, and follow (roughly) the wall on your right to gates and a stile. Cross the stile, then follow the fence on your left along the top of a wooded slope, down to the corner of the field (ignore a stile by some oak trees in the field). Cross the stile in the field corner, go 10 yards down to the left, then turn sharp right along a small path just above Croasdale Beck, to a footbridge. After the bridge, go straight ahead, up a rushy field, to a wooden gate leading into Foss Bank farmyard. Pass left of the house and through a wooden gate next to the semi-detached barn, then up the farm drive, over a cattle grid, past Beethams farm, and along to a road. Turn right along the road, and follow it past Aikengill farm to return to your starting point.